There are more and more signs, apart from the growing number of bicycles on the roads, that cycling is increasingly popular in Kuala Lumpur. There is now a permanent “car-free morning” on the first Sunday of every month. Kuala Lumpur City Hall is planning to build bicycle lanes in the city. A community-build bicycle route map project has just produced Working Draft 2.5 of trialed and tested bike routes in the city. And now we have a bike-friendly cafe. The Grumpy Cyclist, in Taman Tun Dr. Ismail. 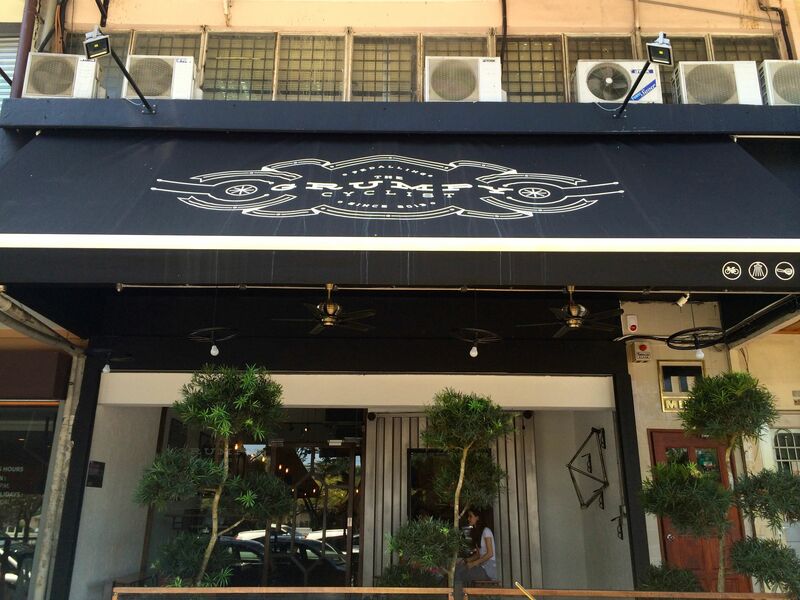 Look for the black awning and white logo at 26 Jalan Datuk Sulaiman. 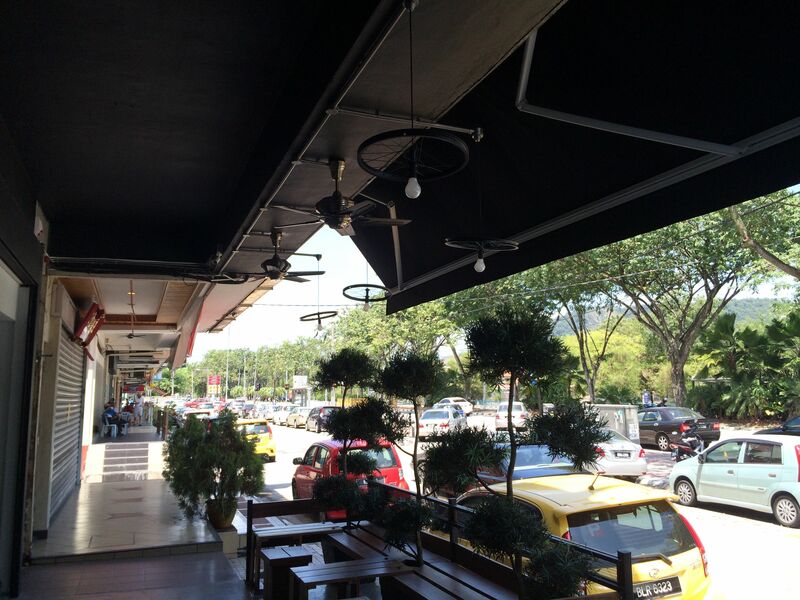 There is outdoor seating at the front of the cafe. 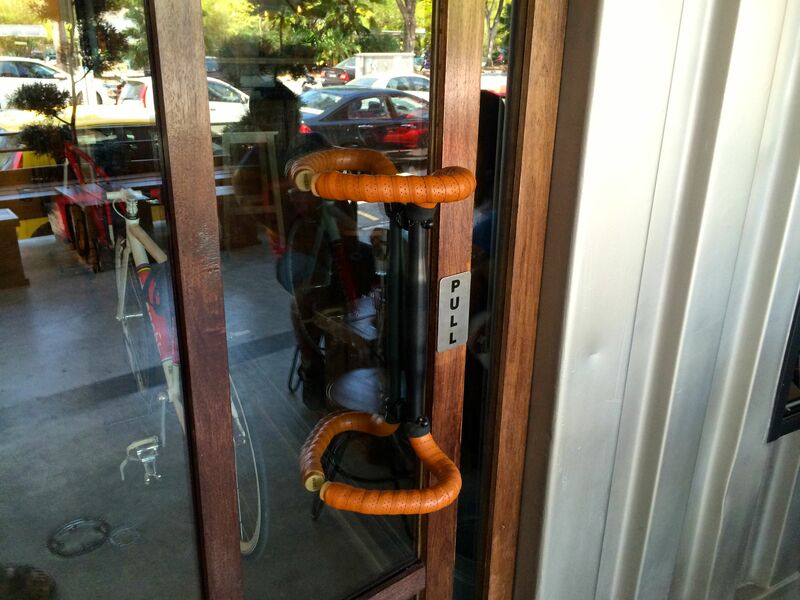 The first hint that this is a cafe for cyclists. . . . Confirmation that this is a cafe for cyclists. . . . The space is warmly lit and welcoming. The decor is of course cycling-themed, right down to the gear rings cemented into the floor and the bicycle wheel light fixtures. The staff are friendly and helpful. 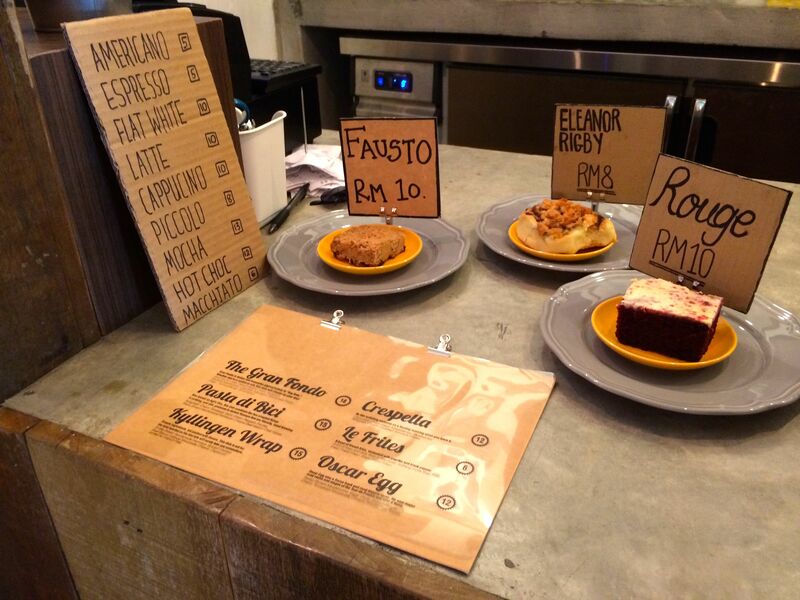 The menu tends to the cyclist’s staples of coffee and cake, but it has already expanded to include wraps and pasta. A dinner menu is planned. 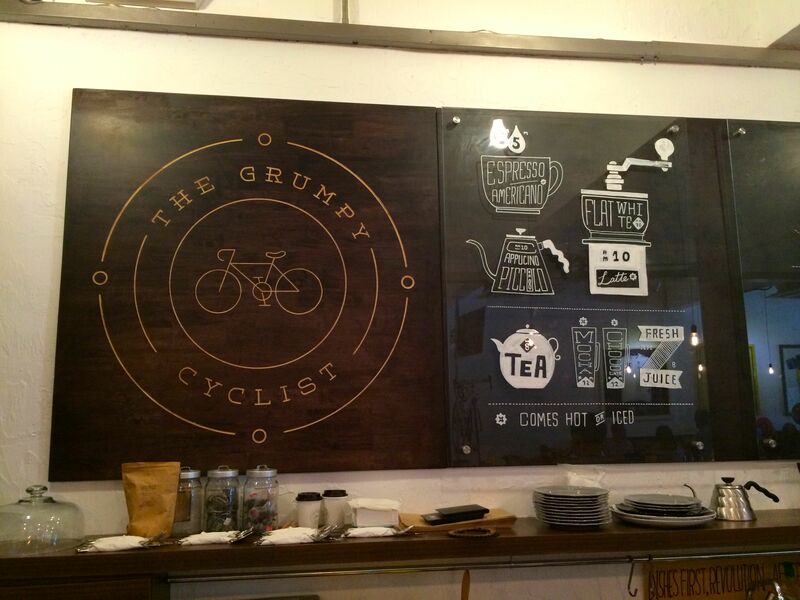 The cycling paraphernalia gives the Grumpy Cyclist a bicycle-oriented feel. All well and good. 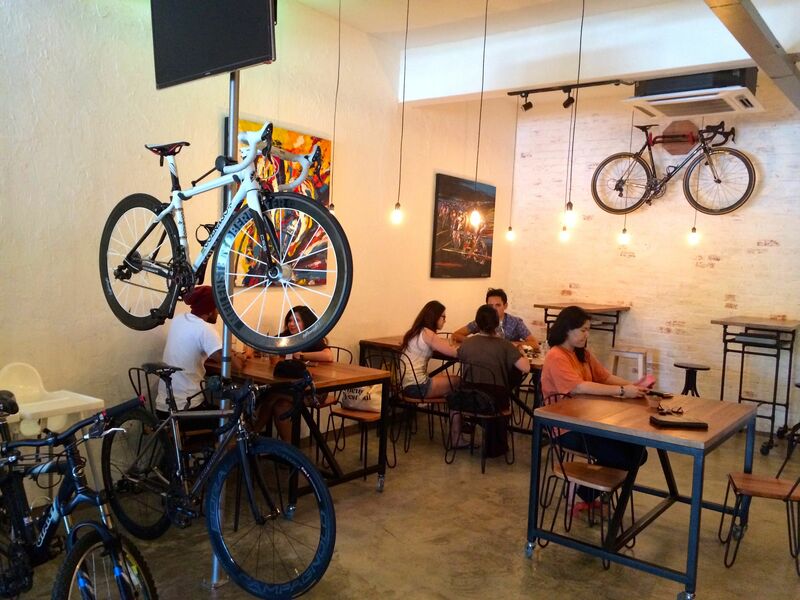 But this place really earns its chops as a cafe for cyclists by providing bike racks, helmet and gear storage, and perhaps most useful, given KL’s heat and humidity, a shower. The next time I am there I’ll have to check if the shower is stocked with toiletries and towels. The Grumpy Cyclist welcomes everyone. You can spot the cyclists though. They are the ones looking closely at the bikes on display. 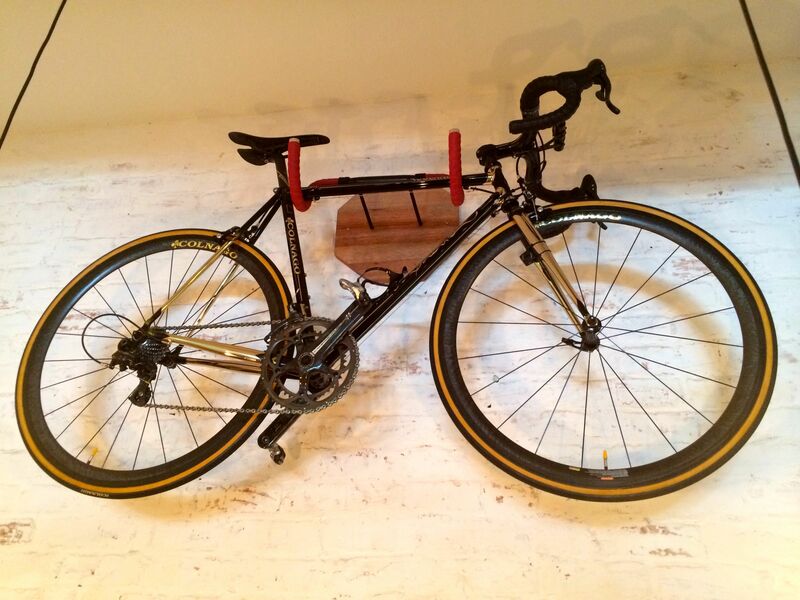 The piece de resistance for me is this Colnago Master 55th Anniversary bicycle on the back wall of the cafe. This example is number 1 of 99 ever made. Click on the photograph and then zoom in to appreciate this work of art. I feel the need for a latte fix. 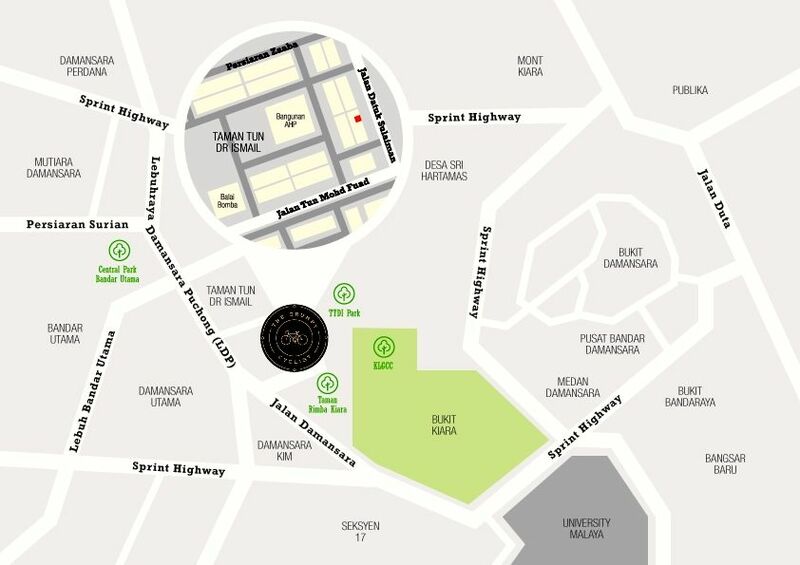 Time to pedal over to Taman Tun. Posted in Cycling in Malaysia and tagged Colnago Master 55 Limited Edition, Kuala Lumpur, Taman Tun Dr. Ismail, The Grumpy Cyclist. Bookmark the permalink.